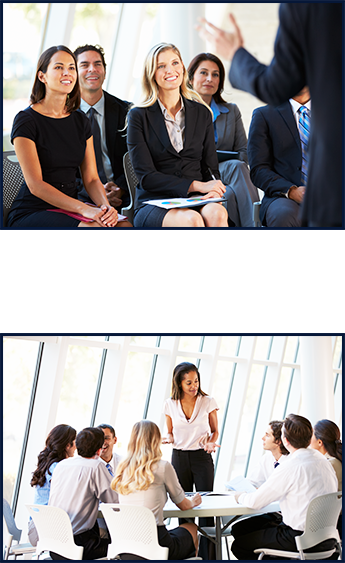 TBG Consulting, LLC facilitates retreats for agencies at on-site or off-site locations that are determined by your business leaders. Retreats offer a chance for board members to discuss and work through leadership issues thoroughly and with candor. 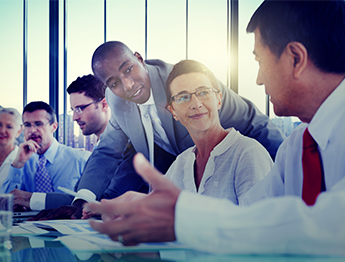 We can develop an agenda and facilitate day long or multi-day sessions during which your board members reflect upon certain topics, such as strategic planning or the organizational mission. The topic is geared to meet the needs of the participants. As your board retreat facilitator, we can speak or provide presenters for your professional meetings, conferences, dinners, or special events. Presentations are targeted for change leaders and participants from for-profit and not-for-profit environments. Workshops and seminars are provided on our client's site or at a predetermined location. We provide workshops in business startup, strategic management, and leadership development. Extensive individual client research is done to understand and customize programs to meet specific needs. We will demonstrate how to apply basic concepts and skills to our client business environment. Our philosophy is to actively engage the participants in discussions on concepts and how they apply to their businesses. L = Lead with a clear purpose. Know what you want to accomplish in a group or your team. E = Empower to participate. Your team will flourish when members feel that they are free to participate in the decision-making process. A = Aim for consensus. Come to an agreement with the members of the team. D = Direct for process. Keep the team focus on the process that will lead to a desired objective and goal. 1. Common Goals — Members of a team need a reason for being and working together. The goals of the team rationalize its existence. Although the goals may change over time, each member should clearly understand what these goals are at any point. The less clear the goals are, the more likely it is that they will be misinterpreted by team members and the more likely it is that the group will suffer internal tensions, argue, and work at a cross purpose. Without clear goals, people become apathetic or use the group to achieve their own personal goals. 2. Leadership — Teams need leaders and members who can lead when necessary. Whether the group has a formal leader or leadership is shared, the group needs people who are willing to take the risk of leadership. Leaders are the people who are respected and influential enough to get others to try team-oriented approaches to working together, obtain support from reluctant members, and build bridges with groups and people outside the team. Leaders help coordinate the work of the team, have good communication skills, and know how to involve everyone. 3. Interaction & Involvement Of All Members — To achieve synergy and group spirit, all team members must contribute actively. Holding back creates problems for the team. Therefore, it is important for team leaders to know how to get everyone involved. 4. Maintenance Of Individual Self-Esteem — The good of the group should not prevail to the point that the members lose self-esteem. Each person's contribution must be heard, valued, and acknowledged. Favoritism must be avoided, and members must be encouraged to be themselves. The challenge to the team and to the leader is to enhance, not lower, the self-esteem of each member. 5. Open Communication — Team members need to feel that they can speak their minds--that the channels of communication are open to everyone, especially to the leader. The team should have ample time to communicate, share information, discuss issues, and use suggestions and bring up new ideas. 6. Power Within the Group To Make Decisions — The work of the team should center on the things it has the power to influence. Giving teams work to do that is not approved for implementation is unproductive and demotivating. Some of the failures of early quality circles in the United States can be traced to the fact that the suggestions they made were sometimes either ignored or vetoed higher up. These teams were not given the power to carry out the work they were asked to do. If more decisions were made at the level where they were carried out, people would have more reasons to work together in teams. 7. Attention To Both Process & Content — For people to function well together as a group, attention must be paid both to the process used to do the work and the content of the work or the group's task. The process includes attention to how people get along together, how the work is structured and distributed, and what the general rules of working together are. Usually, the task to be done receives a lot of attention, while the process of how team members work together is expected to fall into place. Because process problems may hurt feelings and impede progress, it is best to address the team's process, along with its tasks. 8. Mutual Trust — Trust depends on how the leader and members treat one another. When something happens to break that trust (a commitment not met, a confidentiality betrayed, dishonesty), it can be difficult to retrieve. Members and the team leader may need to discuss how their behaviors and attitudes affect trust. Then, everyone will have to try to do those things that will build and maintain trust. 9. Respect for Differences — Team members must feel they can disagree and differ from one another without being punished. The leader sets the tone, but each member has to take responsibility for acknowledging and respecting the needs of others. When individuals on the team are not getting some of their needs met, teamwork becomes demotivating for them. 10. Constructive Conflict Resolution — Conflict is natural. When it surfaces, it must be addressed in a healthy way. Again, the leader plays an important role in helping group members to express conflict and come to a general agreement. Unresolved conflict leads to less-than-adequate performance, resentment, and lack of motivation.